The collect and readings for the Feast of the Baptism of our Lord, Year B, may be found here. The following sermon is based on Genesis 1:1-5 and Mark 1:4-11. Whether it is a day or a decade there are times when we wish we could back up and do things differently. Choose different words to speak. Act in a differently way. Handle a relationship better. Sometimes we just want to do life differently. I think the wishing goes deeper than just doing differently. More than anything we want to be different. Our doing arises out of and reveals our being, who we are, how we see ourselves, one another, and the world. Being and doing are intimately connected. Wishing we could do things differently, and the deeper wish to be a different creation, is really the wish for the first day. Think about some of your first days. The first day as a married person. The first day as a parent. The first day of that job or vocation you had been waiting for and working toward. The first day you took seriously, as a matter of life and death, your faith. First days are filled with light. They hold the promise of all that might be. There is an excitement, newness, and innocence to first days. First days are vibrant, alive, full of dreams and possibilities. I imagine that is how God looked at the first day, in the beginning. No harsh words had been spoken. No feelings had been hurt. No relationships had been broken. There was no guilt or regret. There was only light; the light of life, the light of love, the light of promise and hope; the light of God. And it was good. The first day is always a day of creation. Sometimes in my work with people someone will say, “Oh, I wish I could go back and ….” Often a married couple will say, “We want to go back to the day when our marriage was….” They are all looking for the first day. We cannot go back to the way it was. First day wishing, however, is not really about turning back time. It is about becoming a new creation, a new being. Ultimately, it is about returning to the waters of Jesus’ baptisms. Every time we return to the baptismal waters we return to the first day. Creation and baptism cannot be separated. They are intimately connected and mirror each other. Listen to what Genesis says and how St. Mark describes Jesus’ baptism. In the beginning a wind (or breath, or spirit) of God swept over the face of the waters. 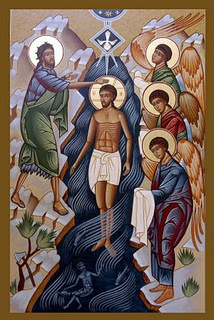 At Jesus’ baptism the spirit (or breath or wind) of God descended on Jesus as he is coming up out of the water. Creation and Jesus baptism are God’s gifts to humanity. Everything God does God does for humanity. Jesus did not need to be baptized. We needed him to be baptized. The baptismal water did not sanctify Jesus; he sanctified the baptismal water. His baptism is not the means by which we identify with him, but the means by which he identifies with us. Our baptism allows us to participate in his baptism. Through Jesus our humanity was present and baptized in his baptism. Our humanity was the humanity upon which the spirit descended. Our humanity was the humanity to whom the Father spoke and with whom he was well pleased. Our humanity was recreated in Jesus’ baptism. It is the first day. In baptism we are a new creation, a new being. Every time we return to the baptismal waters we claim our identity in Jesus as beloved sons and daughters. Every time we return to the baptism waters God again manifests and reveals himself in humanity. Every time we return to the baptismal waters we return to that first day of light, love, life, and the promise of all that might be. Whatever your life has been or might now be, the baptismal waters await you. So return to the water. Let the waters of God’s life wash and rid you of fear, resentment, and despair. Cannonball into the mercy of God. Immerse yourself in the water of God’s love. Splash in the waves of God’s forgiveness. Backstroke through the pool of God’s grace. Dive deep into the gift of having been created in the image and likeness of God. Drift in the stillness of God’s peace. These are the waters of new birth. So come on, the water’s fine! Next Next post: In Whose Name Shall I Baptize You?